Ram Fixture & Packaging | The Wireless Fixture Store! Ram Fixture works on general rollouts with national wireless companies. 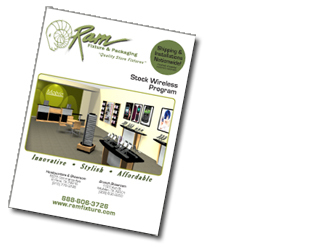 We know the great demand and the lengthy waiting periods experienced with other national wireless fixture vendors, so from this, Ram Fixture has designed a stock wireless fixture program to fit the needs of multiple carrier retailers. shop our wireless fixtures now! If for any reason these fixtures do not suit your needs, contact us and we will work with you on an individual basis to get you fixtures that suit your look, your budget and your time frame...Guaranteed!